Contribution Guideline: When you choose to contribute you will be directed to the secure PayPal portal to make the payment. You do not need to sign up with PayPal to make the payment. You may either choose to pay with PayPal or choose “Pay with Debit or Credit Card” button at the bottom of the page to pay with your own debit or credit card. We are bringing the art of talented Iranian artists from Iran and in diaspora to the San Francisco City Hall and we need your support to make this happen. This exhibition will be set up at the Nowruz 2018 celebration venue at San Francisco City Hall hosted by San Francisco Mayor Mark Farrell and Supervisor District 11, Ahsha Safai, in partnership with Persian Women In Tech on Friday March 23, 2018. The exhibition will encompass digital art projection in the North Court of the City Hall curated from artists around the world titled “Conversation of Art & Nature”. This section explores cultural, spiritual, and creative interpretations of the artists who have been working directly in their natural environment or the nature has been reflected through their creative expression; creating a profound conversation between art and nature. As part of our “Iranian Arts Now” series, our exhibition also showcases the arts in which nature, Spring, and Nowruz are reflected. We will also have a special photo exhibition titled “Iran through My Lens” showcasing profound images of nature, city scape, culture, food, lifestyle, architecture, and ceremonies from Iran. Any amount that you choose to contribute helps us and will make a difference! Thank you for being the reason we and our artists smile! Our upcoming exhibition builds on the success of the inaugural exhibitions that our curators and artists led in 2015 and 2016 at the San Francisco City Hall in partnership with Iranican at the Koret Auditorium of de Young Museum of San Francisco in partnership with NeekOn that encompassed over 500 art submissions from over 200 artists living all over the world including US, Turkey, Tajikistan, Egypt, Malaysia, Ukraine, Canada, and Iran. To learn more about "Iranian Arts Now" series and view details of past exhibition at SF City Hall please click here ! Thanks for choosing to contribute in the Silver Level. As a small token, we will send you a thank you postcard with the image of a curated artwork participated in our exhibition*. Thank you for brightening the world for us and our artists! We want to change the stereotype and the status-quo narrative about Iranians and Iranian community that is aired all the time in the mainstream media. Let’s offer an alternative narrative that is closer to the reality of the richness of our culture, people, and community. Iranian community is one of the fastest growing communities in the Bay Area, California and yet is among underrepresented and underserved communities. This exhibition provides an opportunity for visibility of Iranian community and represents a creative and artistic group of them; and for the greater public it provides an opportunity to get to know this community, start conversation with them, exchange thoughts, and discover their unique artistic styles. The Nowruz venue at San Francisco City Hall brings a huge community of Iranians, non-Iranians, and city dignitaries together and is the best opportunity for us to make our wonderful culture and unique art more visible in this society. Join us and support us in evoking this different narrative and show the public that Iran and its culture is alive, productive, and has lots to offer to the world and should not be marginalized or be depicted as enemy. Thanks for choosing to contribute in the Gold Level which makes a big difference in our project. As a small gift, we will send you a set of ceramic coasters with the image of a curated artwork participated in our exhibition*. Thank you for being an important part of our story! This exhibition provides an opportunity for artists around the world, specially the ones living in Iran to showcase their work and get professional exposure. It gives local artists an opportunity to start a conversation with people in the venue and change the stereotypical narrative by their art and presence. It provides an opportunity for the public to view the arts of Iranian artists, see their creativity, and explore the depth of their culture. It provides an opportunity for our backers who contribute through their business, a great exposure. We include the names and the logo of the business sponsors with links to their websites on our campaigns, website, and on the digital art projection at the exhibition if the business contributes in our Gold or Platinum levels. It provide an opportunity to our individual backers to contribute to a meaningful cause, support young and talented artists, and help shift a biased narrative toward a minority community. Many of our individual backers have asked us not to publish their names, so, we will not publish individual names unless someone specifically asks us to**. Not on the contributions: Contributions and supports might take up to 24 hours to reflect in our campaign. So, if your contribution is not reflected immediately do not worry, it will be reflected by the next day. Thanks for choosing to contribute in the Gold Level which makes a huge difference. As a small gift, we will send you a gallery board with the image of a curated artwork participated in our exhibition*. Saying thank you is not enough to express all the gratitude we feel to you, so we would like to thank you from the bottom of our hearts for being part of our journey! We have a budget of $8,700 to make this exhibition reality. 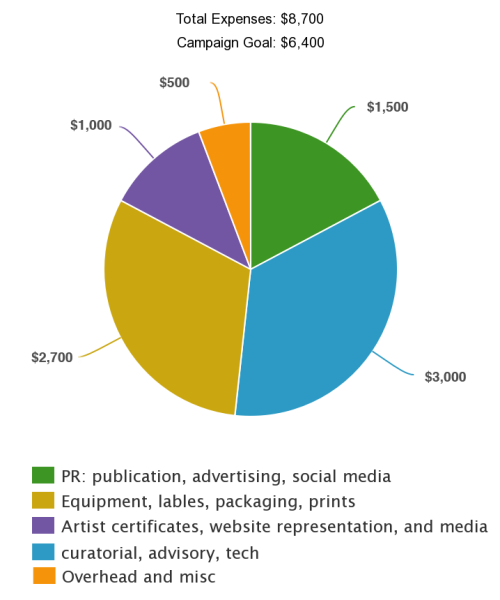 Out of that, we need to raise $6,400 through our crowdfunding campaign and we are raising the rest of it through organizational sponsorships and minimal artwork submission fees. We are committed to showcase any talent in the world, so, we give an option of free participation for artists that can not make payment due to international restrictions or extreme lack of fund. Your contributions will provide all these artists an opportunity to participate in this exhibitions. In addition to contributing to our crowdfunding campaign, please help us and spread the word. Share our Facebook page, share our Instagram page, and tell all of your friends about the exhibition and its impact. The more people know about this, the better it will become. Let’s make this happen together. The San Francisco City Hall, Iranican’s Nowruz Celebration Venue and Rite of Passage Echibition, March 25, 2016. SEE DETAILS HERE! *Please note that this campaign is an effort of our gallery and a collective of local artists trying to make this exhibition happen. The Persian Women In Tech is the organizer of the Nowruz venue and is the host of the exhibition, but it is not the fiscal sponsor of this exhibition. Contributions and financial supports will not go through this organization or any other non-profit organization and are not tax-deductible. ** All tokens and gifts are provided and will be sent to you by our sponsor, SilkMindsTM.